Today we take a look at Crawford County's Sugar Lake. This kettle lake is particularly beautiful, as are all of the glacial lakes that are located in Crawford County. With rural surroundings and unspoiled wetlands adjacent to this lake in the Erie National Wildlife Refuge, this lake is in excellent shape. I was particularly enamored with the beauty of this lake. Glacial lakes are limited to the top corners of the state, for glaciers only occupied these spots in the state. 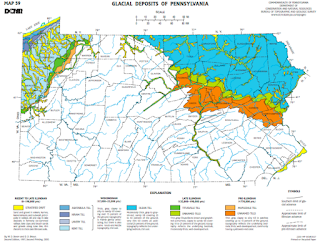 Fifty kettle/glacial lakes are located in the state, with the vast majority on the northeastern side of the state. Seven of these lakes are located in the northwestern corner of the state, Edinboro, Sandy, Conneaut, Pleasant, LaBeouf, and this one, Sugar Lake. The lake is surrounded by pristine wetlands and forests. There is a six horsepower limit on boat motors, and this helps to keep the lake in great shape. We highly recommend spending some relaxing time at this lake and the other kettle lakes throughout Crawford County and the rest of the state. My family was the first to settle at Sugar Lake, right down the road from the boat ramp.